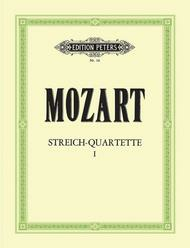 String Quartets, Volume 1: The 10 Famous Quartets composed by Wolfgang Amadeus Mozart (1756-1791). For string quartet (2 violins, viola, cello). Classical Period. Difficulty: medium. Set of performance parts (parts only, score not included). Thematic index and introductory text. 280 pages. Published by Edition Peters (PE.P00016).ISBN M-3007-0001-4. With thematic index and introductory text. Classical Period. 9x12 inches.Contents -- 6 Quartets dedicated to Haydn: K387 in G (1782) - K421 in d (1783) - K428 in Eb (1783) - K458 in Bb/"Hunt" (1784) - K464 in A (1785) - K465 in C/"Dissonant" (1785) - K499 in D/"Hoffmeister" (1786) - "King of Prussia" Quartets (the King of Prussia, for whom Mozart wrote these quartets, was a cellist of no mean ability, if one may judge by these three works, whose cello parts are both elaborate and demanding, often soaring into the extreme upper range, leaving the viola to fill in temporarily as bass instrument! ): K575 in D (1789) - K589 in Bb (1790) - K590 in F (1790)2 Violins, Viola, Violoncello (set of parts).